A breakup is hard, plain and simple. How you handle moving forward can define your strength of character. There is significant benefit you can draw from the Stoic philosophy and applying the lessons for moving through a difficult breakup. Which allows me to briefly discuss a common objection to Stoicism: yes, it is all well and good that I know something at a rational level, but it is an altogether different thing to internalize that same notion. If your relationship ended, whether by choice or by surprise, from a Stoic perspective, you shouldn’t dwell on something that is now gone. And yet, your feelings of sadness and regret keep haunting you. So what’s the point of Stoicism, then? Many of us have gone through a difficult breakup, of course, and the difficulty always exists between the cognitive understanding of something and the ability to take control of our emotions to let go of that thing is why Stoicism is 90% practice, not just theory. 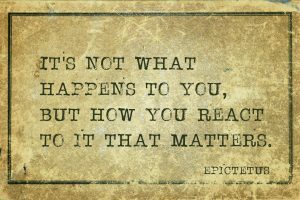 Pick a small set of quotes from the Stoics, such as the ones above, that resonate with your specific situation and read them every day, pausing to reflect for a few minutes on their meaning as it applies to you. Keep a philosophical diary, use it to allow yourself to express your feelings, but also to write about them in a detached way, in order to help yourself gaining some distance from them. But there is also a positive aspect to the Stoic advice. While regret and sadness for actions you can no longer redress is a waste of time and emotional energy, carefully and dispassionately reflecting on what happened in order to learn from it is a very good use of your time. This is the process of becoming self-aware and growing as a man. Think carefully about how you may avoid repeating those mistakes in the future. If you were blindsided remember, life can be a fickle mistress: one day you are at the top, the following one you feel miserable. Your only defence against that is to cultivate your positive mindset, in love as with anything else: appreciate what you have when you have it, let it go when the universe takes it back. Finally, understand there is more than one person out there for all of us. You can and will find someone else to share the intimate aspects of your life. A breakup is not a death sentence. Get back out there. There are plenty of wonderful people in the world, and life is better when we are with one of them. Your advice has perfect timing. I am going through this exact same bullsh**. I know about living in the present moment from books, such as Eckartt Tolle “Awakening to your lifes purpose” and others, but…sometimes my mind forgets to function properly. It loves to turn toward the negative. Your email helped me to remember, its not happening now. Life is. And its happening without me! Im going to l7ve today as per your advice. Thanks again! You bet Clifford, great books – live each day every day! It is good to mine the precious gems left by the Stoics. Thank you for this on a day when I am facing a different form of grief. The reminder to remain in the present and the contemplation of the griefs of others had a medicinal effect on me just now. Let me know if you ever need anything… and yeah the Stoic philosophy is much needed in my opinion!